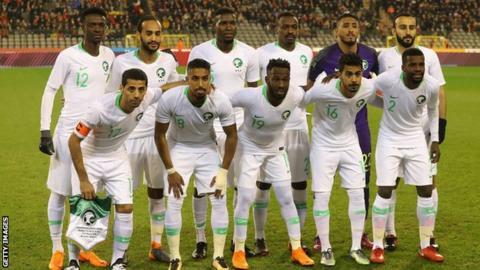 Saudi Arabia have named an entirely domestic-based squad for the 2018 World Cup. Winger Nawaf Al Abed failed to make Juan Antonio Pizzi's 23-man squad having struggled with injury since the start of the year. Saudi Arabia, who lost 3-0 to Peru on Sunday, face hosts Russia in the opening game on 14 June. Saudi Arabia, who are making their first World Cup appearance since 2006, also face Egypt and Uruguay in Group A.
Goalkeeper Assaf Qarny, defenders Saeed Al Mowalad and Mohammed Jahfali, and midfielder Mohammed Al Kuwaykibi were also cut from last month's 28-man preliminary squad. The squad was announced via a video posted online showing the news about each player spreading through coffee shops, offices and football pitches. Fahad Al Muwallad, Yahya Al Shehri and Salem Al Dawsari have been included after returning to their parent clubs in Saudi Arabia having spent four months on loan in Spain. Al Dawsari played 33 minutes for Villareal against Real Madrid in La Liga, while Al Muwallad made two substitute appearances for Levante. Saudi Arabia also lost 2-1 to Italy in a friendly last week. Fifa dropped Saudi Arabian referee Fahad Al Mirdasi from the World Cup after he was banned for a match-fixing attempt in his country. Which players are going to the World Cup?